Figure 1. Treatment of Jurkat cells with H2O2 stimulates phosphorylation of SLP-76 at Ser376, but does not affect the level of total SLP-76 protein. The relationship between lysate protein concentration from untreated and H2O2-treated Jurkat cells and the absorbance at 450 nm using the FastScan™ Phospho-SLP-76 (Ser376) ELISA Kit #30794 is shown in the upper figure. The corresponding western blots using phospho-SLP-76 (Ser376) antibody (left panel) and SLP-76 antibody (right panel) are shown in the lower figure. After serum starvation, Jurkat cells were either left untreated or treated with 11 mM H2O2 for 3 minutes at 37°C and then lysed. The FastScan™ Phospho-SLP-76 (Ser376) ELISA Kit is a sandwich enzyme-linked immunosorbent assay (ELISA) that detects endogenous levels of SLP-76 when phosphorylated at Ser376. To perform the assay, sample is incubated with a capture antibody conjugated with a proprietary tag and a second detection antibody linked to HRP, forming a sandwich with phospho-SLP-76 (Ser376) in solution. This entire complex is immobilized to the plate via an anti-tag antibody. The wells are then washed to remove unbound material. TMB is then added. The magnitude of observed signal is proportional to the quantity of phospho-SLP-76 (Ser376). Antibodies in kit are custom formulations specific to kit. 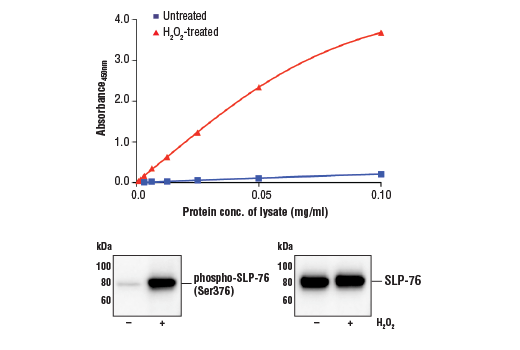 The FastScan™ Phospho-SLP-76 (Ser376) ELISA Kit detects endogenous levels of SLP-76 when phosphorylated at Ser376 as shown in Figure 1. This kit detects proteins from the indicated species, as determined through in-house testing, but may also detect homologous proteins from other species. SH2 domain-containing leukocyte protein of 76 kDa (SLP-76) is a hematopoietic adaptor protein that is important in multiple biochemical signaling pathways and necessary for T cell development and activation (1). ZAP-70 phosphorylates SLP-76 and LAT as a result of TCR ligation. SLP-76 has amino-terminal tyrosine residues followed by a proline rich domain and a carboxy-terminal SH2 domain. Phosphorylation of Tyr113 and Tyr128 result in recruitment of the GEF Vav and the adapter protein Nck (2). TCR ligation also leads to phosphorylation of Tyr145, which mediates an association between SLP-76 and Itk, which is accomplished in part via the proline rich domain of SLP-76 and the SH3 domain of ITK (3). Furthermore, the proline rich domain of SLP-76 binds to the SH3 domains of Grb2-like adapter Gads (3,4). In resting cells, SLP-76 is predominantly in the cytosol. Upon TCR ligation, SLP-76 translocates to the plasma membrane and promotes the assembly of a multi-protein signaling complex that includes Vav, Nck, Itk and PLCγ1 (1). The expression of SLP-76 is tightly regulated; the protein is detected at very early stages of thymocyte development, increases as thymocyte maturation progresses, and is reduced as cells mature to CD4+ CD8+ double-positive thymocytes (5). Clements, J.L. (2003) Immunol Rev 191, 211-9. Bubeck Wardenburg, J. et al. (1998) Immunity 9, 607-16. Bunnell, S.C. et al. (2000) J Biol Chem 275, 2219-30. Liu, S.K. et al. (1999) Curr Biol 9, 67-75. Clements, J.L. et al. (1998) J Immunol 161, 3880-9.